Replacement of the piston seal of a piston-filler is usually a straightforward operation once the pen has been dismantled. The end flange of the piston typically unscrews, allowing a new seal to be installed. 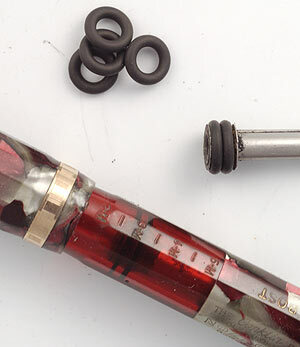 The Conklin Nozac is more problematic, since the piston head is permanently assembled, requiring the new seal to be either cut in half and glued together around the piston head, or stretched over the piston head flange (the original seal consisted of one disk of rubber and another of cork, put in place before the piston head flange was crimped in place). After considerable experimentation, we have settled upon pairs of O-rings as the optimal form of replacement seal. The rings can readily be stretched into place, and the space between the rings provides a recess that can trap silicone grease, greatly reducing the need to relubricate. With rings of the correct size, the seal against the barrel wall is airtight, yet there is much less friction than with any other material we have tried to date -- an important consideration with Nozacs, whose screw mechanism is lightly built and easily overstressed if the piston head is too tight. We are currently providing seals in sets, with each set containing seals in four thicknesses, denoted as A, B, C, and D. A and B will fit most standard-sized (5000-word) Nozacs; use C or D for oversize pens (7000-word). Nozacs vary in internal dimensions, so you may have to try a couple of different sizes for optimal results. A properly-sized seal should allow the piston to move with only modest resistance, with the seal contacting the inside of the barrel continuously all the way around, from the outside appearing as a thin, unbroken line. More Conklin Nozac info here. Piston seal repair kits are listed here.